updating the public on the latest progress with targeted antibody treatment. cancer treatment developments, you'll have to keep tuning in to BEL and Real Science Radio! * Feb 2019 Update: BEL caller Brad H. from Vancouver, BC (kgov.com/brad-2015) called off-air on 2/14/19. His father, who's bladder was removed as its cancer spead to his lymph nodes, had two rounds of chemo with no apparent benefit. Brad thanks BEL for suggesting that patients urge their oncologist to explore immunotherapy. For now, a year after being accepted into a trial, Brad's father appears to be cancer free! * April 2019 Update: More than 1 in 4 go into full remission in small lymphoma immunotherapy trial, now going into larger clinical trial including for breast and head-and-neck cancers. * June 2018 Update: Florida woman cured of advanced breast cancer. See the BBC's report on the U.S. National Cancer Institute's amazing success with Judy Perkins, given three months to live and now recovered! * Oct 2018 Update: Initial targeted antibody immunotheorapy success is being reported for the especially devastating triple-negative breast cancer. * Targeted Antibodies Cancer Treatment Revolution: Among the stunning results for targeted antibodies cancer treatment, CBS News reported on 35 terminally-ill advanced-stage leukemia sufferers. The disease went into remission in 94%, or 33 of 35 patients. Dr. Michael Grossbard, New York University's Perlmutter Cancer Center leukemia specialist told CBS News, "Oncologists are reluctant to use the word extraordinary. But these [results] are extraordinary. 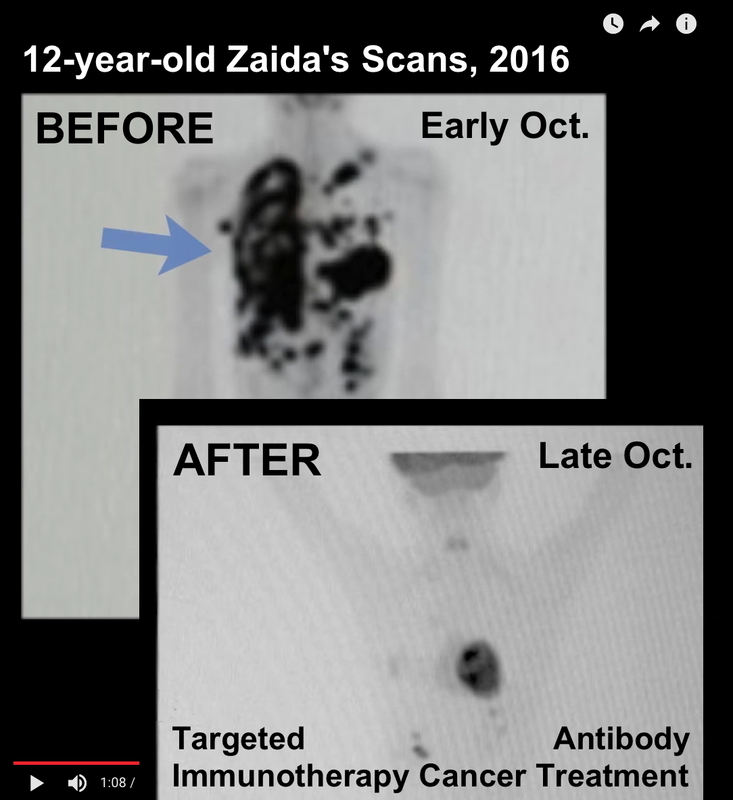 These are really remarkable findings..."
* ArcherDX in Boulder, Colorado: ArcherDX spearheaded the effort to extend the life of 12-year old Zaida. Real Science Radio host Bob Enyart interviews Archer's CEO Jason Myers to discuss Zaida's case and to get a better understanding both of this revolution in cancer treatment and of how targeted immunotherapy works. Studies in the U.S. and the U.K. are seeing hundreds of patients with many types of cancer virtually "cured", as some oncologists are now putting it. Not every patient though responds well, and some few have even died from the treatment. Update: Sadly, Zaida herself passed away on March 10, 2017 and while RSR would like to learn the specific cause, of course the family's privacy desires comes first. Overall though, the widespread success is stunning. ArcherDX provides the technology so that a patient's doctor can find out quickly what specific mutations may be causing the cancer. Now, a growing number of oncologists will be offering their patients the greatest of hope through individualized treatment that, like an archer aiming at a target, just might hit the bullseye. Online at ArcherDX.com, this next-generation sequencing (NGS) firm develops what is called target enrichment chemistry. - 2019: Progression-free breast cancer survival improves in a Phase III trial for more than a quarter of the women using antibody drug Margetuximab. - 2017: Reported by the London Telegraph, "Terminal cancer patients in complete remission after one gene therapy treatment", Of 101 patients suffering in advanced stages aggressive Non-Hodgkin lymphoma, 36% were still in complete remission at six months with 80% seeing cancerous cells shrink by at least half! - 2017: Viruses including HIV (see Nat'l Geographic) and LCMV (see the Telegraph) are now being harnessed (as viral vectors) to bring targeted cancer-cell-killing immunotherapy to the aid of patients. The HIV delivery system has already been successful in patients and after succeeding with laboratory mice, the LCMV is headed toward human trials. - 2017: 10%! In a CBS News report of another 12-year-old saved by antibodies, Dr. Steven Rosenberg at the Nat'l Cancer Institute, perhaps the world's leading expert on targeted antibody treatment, estimated, “If you look at all cancer patients, perhaps ten percent can be helped by immunotherapy today. But it's getting better every day." - 2017: 60-year-old has no trace left of his lung and lymph node cancer after targeted immunotherapy. - 2017: World First: Now, with targeted antibody treatment, two babies suffering from Leukemia have been cured. - 2016: Sean Parker, the first president of Facebook funds a major CRISPR-enabled targeted antibodies human trial after founding a stunningly brilliant immunotherapy research clearinghouse to "solve cancer". - 2016: The Daily Mail reports that University Hospital is starting to use the word "cure" and also the words "hugely effective" to describe the results of targeted antibody treatment for some cancers including "lung and skin cancer... kidney, bladder, and head and neck cancers [which include] some of the most aggressive types which are extremely difficult to treat and, together, claim hundreds of thousands of lives each year." - 2016 CBS News reports "extraordinary results" for targeted therapy for 94% of patients with leukemia. - 2016 Fox News reports that more than half of sufferers with non-Hodgkin's lymphoma ended up symptom-free with 80% responding positively! 50-year-old lung cancer sufferer in hospice, recovered! - 2016: Now it's lung cancer! A Daily Express report on late-stage lung cancer "cure" using antibody treatment (immunotherapy) virtually cured a bedridden hospice patient with advanced lung cancer that has metastasized to his lymph nodes. His oncologist gave this 50-year-old two weeks to live (though such estimates can be notoriously wrong). But two weeks after his antibody treatment with the drug called Opdivo, a drug already available in the U.S., he recovered and returned home, even though previously, his lung cancer already had spread to his vocal cords and lymph nodes. Check this out also in Britain's Daily Express ("...'remarkable' success fighting end-stage lung cancer in trials, experts say. It is also effective against other cancers") and here on BEL. - 2016: In one British trial, "patients with advanced skin cancer who would have been declared terminally ill are now back at work and are predicted to live until old age." - 2016: The Daily Mail, Are we nearing a cure for cancer? Holy grail is 'closer than ever', oncologist claims quotes Dr Rebecca Kristeleit, of University College London Hospital, who reports that advances in a revolutionary treatment called immunotherapy [targeted antibodies] were now occurring at a rapid rate. Dr Kristeleit added: 'We are beginning to start thinking about using that word 'cure'... As an oncologist, it's not a word you would ever say. This is because we talk a lot about being 'in remission' - but 'cure' is the Holy Grail." In Kristeleit's "area of gynaecological cancers, scientists and doctors [are] seeing dramatic responses in the very first human trials... increasing patients' cancer survival rates... in melanoma and lung cancers they were licensed and working." - 2016: RSR explains the two different approaches to cancer immunotherapy, inhibitors and re-targeting. About the first approach, today's Real Science Radio interview (to listen in, just click Play above) with Archer's Jason Myers discusses the checkpoint inhibitors approach, which removes molecular roadblocks allowing the immune system to do its job. - 2016: RSR also explains the second approach, whereby technicians actually re-target the antibody cells themselves. This approach is described in two must-hear Real Science Radio programs. To begin with, RSR talks to molecular biologist Kevin Anderson about this second re-targeting technique. Dr. Anderson points out that as a general observation and because of it's power, "The immune system cannot be defeated", when it is given the opportunity, the correct targeting, and the green light. In a typical therapy, antibody cells from a cancer patient are removed, molecularly altered, and then about 90 billion re-targeted antibody cells are injected back into the bloodstream. These miniature weapons then focus on taking out the cancer, a goal that they then share with the body's immune system, something that expert Dr. Jeff Bluestone describes as, "an incredibly powerful force designed to recognize everything that's foreign." (Dr. Bluestone may or may not have meant "designed", literally, but Dr. Anderson does.) 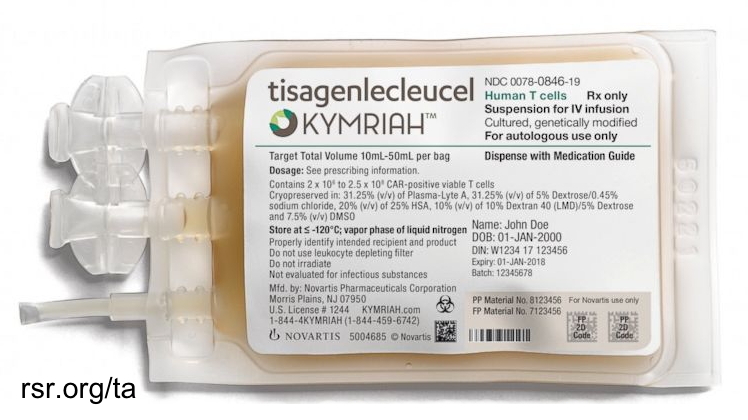 This re-targeting approach is also described at the links above, to CBS and the Telegraph, the latter reporting on a particularly successful treatment from U.S. firm Kite Pharma, which "works by filtering a patient's blood to remove key immune system cells called T-cells, which are then genetically engineered in the lab to recognise cancer cells." Also on RSR, hear the dad who lost two young children to a rare mutation disease who explains to RSR how the immune system goes through permutations of possibilities seeking to target pathogens. - 2016: Bob Enyart reports on the Amazing Ongoing Targeted Antibody Cancer Trials. - 2015: Targeted antibody trial for 945 advanced stage melanoma patients, 6 in 10 stopped advance or even shrank tumors. Yale University's School of Medicine chief of medical oncology says that treatment using the body’s immune system to attack cancerous cells might replace chemotherapy as the standard cancer treatment within five years." - 2014: A multicenter clinical trial of 63 pediatric and young adult patients with acute leukemia saw a remission rate within three months of treatment of 83 percent! - 2012: The first child injected with modified antibodies, Emily Whitehead, recovered from near death to to become "cancer free" and she's remained that way after the treatment she received from the University of Pennsylvania researchers. * RSR's Advice to Wealthy Cancer Patients in Remission: During these early years of this cancer treatment revolution, we suggest that especially wealthy cancer patients whose disease is "under control" or in remission explore the possibility of paying the costs to preemptively customize an immunotherapy treatment for their own cancer so that they can hopefully ward off any future resurgence of their own disease. Then of course, as an added benefit to mankind, the knowledge learned and treatment devised for one person may later also help a thousand other moms, dads, kids, and regular folks. * Scientists' Insight: Scientists in Dallas including Randy Guliuzza (Master of Public Health from Harvard) and Frank Sherwin (parasitologist from UNC, a bit north of RSR's studio in Colorado), argue that the "immune system" is part of a much broader infrastructure which they call the MIS, or microbe interface system. Earlier in his career, RSR host Bob Enyart worked in Redmond, Washington for Microsoft as a program manager, and for the US West phone company as a business systems consultant, and for PC Week as a senior technical analyst. So the abbreviation MIS, which decades ago in the computer world stood for Management Information System, rings true. However, perhaps even this term may require greater broadening still, or perhaps this biological MIS may be viewed as part of an even broader system, as the targeted antibodies cancer therapy revolution uses the immune system to target our own homegrown, though abnormal, cells. - 2019: UK scientists create database of the DNA fingerprint of dozens of environmental causes of genetic strains of cancers including tobacco and diesel exhaust. - 2019: Massive study recommends against chemotherapy for 70% of breast cancer patients. - 2019: Promising two-week automated test evaluating various drugs on hundreds of "organoid" mini tumors lab-grown from patient's own cancer cells. - 2019: Soon a drop of blood may be sufficient to detect ten different cancers. - 2018: Using LASER, researchers cure nearly 50% of patients with prostate cancer! - 2017: CRISPR genetic editing is curing Duchenne Muscular Dystrophy in mice (after a 20-year-long Junk-DNA delay). - 2017: Pathologists find 73% of metastasized breast cancer tumors; previous tech 83%; Google's at 93%. - 2017: Univ. of Calif. scientists develop early-detection CancerLocator blood test which even reveals tumor location. - 2017: Placed on the skin and zapped, Ohio State's stunning "TNT" silicon chip rapidly generates stem cells to either heal skin or deeper tissue, or to be extracted and injected into damaged tissue elsewhere. - 2017: The cure for allergies may reside in gene immunotherapy after successful lab tests at the University of Queensland. - 2016: Man cured of prostate cancer after testosterone treatment, shocking improvement for many others in study. - 2016: After wiping out tumors in early tests a molecule in Australian berries is now in human trials; per QBiotics. - 2016: MRI inventor here on RSR on his discovery of CSF flow and implications for neurodegenerative disease. - 2016: The powerful "N6" antibody targets 98% of HIV strains. - 2012: See the home heart attack detection kit made, in Israel, at rsr.org/novamed-sensaheart. - 2010: Related -- See RSR: Nat'l Cancer Inst. Researcher Admits Abortion/Breast Cancer Link. - 1890s: The "Father of Cancer Immunotherapy", Dr. William Coley, made one of the earliest discoveries of the ability of the immune system to defeat cancer. The journal Nature had a longtime policy against publishing papers on genetic science because Gregor Mendel's exacting discoveries undermined the freewheeling needs of Charles Darwin's theory. Likewise, the widespread evolutionary claim that the human body is poorly designed pervaded the 20th century. (It initially inflicted C.S. Lewis and is still vestigial in Richard Dawkins.) Ideas have consequences. That "dysteleology" claim is likely a major factor in understanding why for a century most in mainstream cancer treatment ignored the immune system while millions lost their lives to failed cancer treatments. - 2017 for Vets: Maddie's surgery and treatment with Vetivax customized immunotherapy. - Please feel free to send encouraging cancer treatment reports to Bob@rsr.org. Thanks! explaining the "targeting" concept. Hear it. Thanks so much for your tireless work of studying and proclaiming the Lord's truths in your church and on the airwaves (and the Ethernet-waves). You've probably already heard of this, but I just ran across an article that was very interesting in the LA Times about how the oncological field is making dramatic shifts due to the incredible effectiveness of immunotherapy. In the article, it's so interesting how they describe the vast sophistication of these systems as if they were wonderfully designed - praise the Lord yes they are! I've taken great interest in this field since I was diagnosed with colorectal cancer a couple of years ago and went through the traditional path of surgery and chemo, but let's face it those methods often are only temporary respites in cancer's progress. My oncologist, who is a part of a large hospital system in Indianapolis, didn't seem to know much about it either. I've learned so much about the field through your show, and finally am starting to see it appearing in the wider press.